At the outset of this final SPIRAL newsletter, we would like to take this opportunity to thank all contributors to SPIRAL, both inside and outside the project team. It has been a pleasure working with such motivated, hard-working and visionary colleagues. We also thank the European Commission, not only for its financial support through FP7 but also through regular and enthusiastic interactions with colleagues from the Commission and the EEA. Although the SPIRAL project ended in November 2013, we sincerely hope the SPIRAL community and products will continue to be as vibrant as over the last three years. With input not only from project partners but a host of other “spirallers”, including our network of advisers, our participants to workshops, our reviewers, interviewees and test case contributors, we have produced a number of outputs we hope will be useful to individuals, groups and institutions involved in or hoping to be involved in science-policy interfaces. A la carte digestible information on specific aspects of SPIs SPIRAL set of 34 briefs ranging from understanding biodiversity and SPIs, to experiences from existing SPIs, features for successful SPIs and improved communication. A complete set of digestible information on SPIRAL results SPIRAL resource book on good practices to improve the effectiveness of existing science-policy interfaces or develop new ones. By compiling all the SPIRAL briefs in one place, the resource book synthesises all information gathered and research done throughout the SPIRAL project. The resources are presented according to the categories of actors to whom they may be relevant. The SPIRAL handbook to design, improve and maintain SPIs aimed at research projects but applicable to all individuals and groups wanting to get more out of SPIs. Academic publications emerging from SPIRAL A series of published and (hopefully) soon-to be published papers in academic journals. 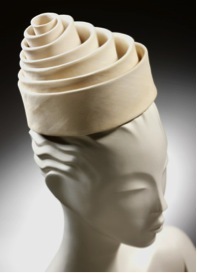 More in-depth information on all aspects covered in the SPIRAL project and the approach taken. The SPIRAL project reports. In the last months of the project, Spirallers put their SPIRAL hats on again and participated in events about science-policy interfaces. 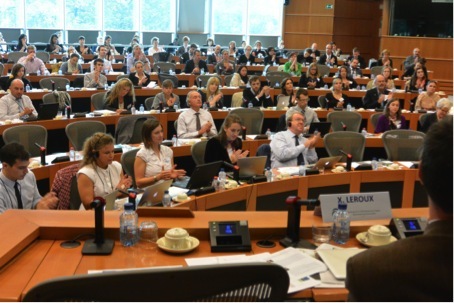 On September 24th 2014, the European Parliament Intergroup 'Climate Change, Biodiversity and Sustainable Development' organised a one-day conference entitled 'Meeting the EU 2020 Biodiversity Targets: Mainstreaming Conservation' . SPIRAL was invited to make a keynote presentation in the session on 'Linking biodiversity science to policy-making'. Representing SPIRAL, Sybille van den Hove talked about "Science-Policy Interfaces for Biodiversity Governance: Tools for transformation". the erroneous conception that science-policy interfaces are simple forums through which reporting of scientific knowledge leads to the development of policy through optimisation, in clear, controllable and unproblematic ways. Going beyond these myths in practice requires a dynamic and iterative vision of co-evolution between science and policy in a landscape characterised by a multiplicity of science-policy interfaces. She concluded on the SPIRAL conviction that science-policy interfaces are potent levers of transformation towards sustainability. Interfacing at the EP meeting. 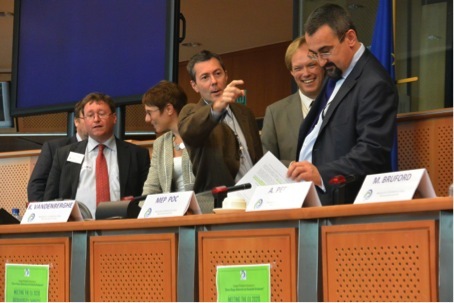 From left to right: Thomas Brooks, Head of Science and Knowledge, IUCN; Sybille van den Hove, co-coordinator of SPIRAL; Xavier Leroux, coordinator of BiodivERsA 2; Kurt Vandenberghe, Director 'Environment', European Commission DG RTD; and Pavel Poc, Member of the European Parliament. 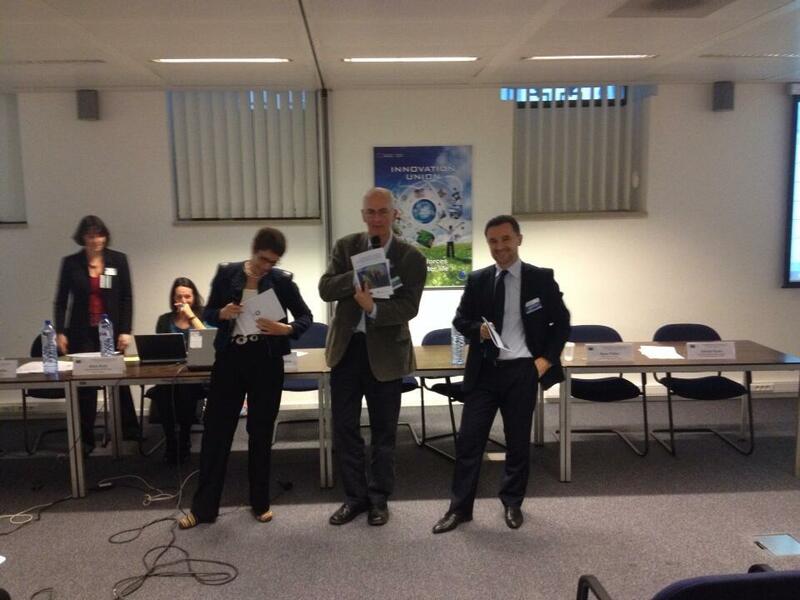 SPIRAL provided support to the European Commission Directorate General Research and Innovation, Environment Directorate, Unit of Management of Natural Resources to organize a workshop on “Biodiversity and Ecosystem Services: a strategic dialogue between science and policy” which took place in Brussels on 14-15 November, 2013. This workshop aimed to explore how EU-funded research projects could improve their science-policy interfaces and enhance their role and contribution to policy development and implementation in the current policy context (within and beyond the environmental sector). The first day focused on initiating the dialogue between project delegates and policy makers making use of policy briefs developed by projects to address some policy questions identified by policy makers from various sectors. Participatory sessions allowed for exchanges and increased the understanding of both sides: policy needs and requirements and research framework and constraints. Discussion outputs consisted of recommendations for improving communication products and other SPI activities. Soft outcomes are also expected from the workshop as participants had the opportunity to meet, exchange, express their interests and build trust. The second day allowed EU-funded research projects to explore areas of possible collaboration to increase synergies and avoid duplication of efforts especially when designing SPI activities such as common workshops or awareness-raising events. Other areas of collaboration related to data collection and archiving, and to the possible use of common IT platforms. The evaluation of the workshop was positive and several participants expressed their interest to see this kind of workshop organised on a regular basis. The event also marked the launch of the SPIRAL handbook! As we reach the end of the SPIRAL project, it is important to look forward towards the challenges that remain and the opportunities that SPIRAL has created to help meet these changes. We highlight three areas of future activity: further strengthening the biodiversity science-policy interfaces, development beyond the biodiversity sector, and training. Although many lessons have been learnt and shared during the SPIRAL project, there remains an enormous amount of work to do to achieve effective engagement between science, policy and society. The steps now being taken by IPBES are enormously encouraging but the size of the challenge that IPBES faces should not be underestimated. More generally, the need for much greater engagement between science and policy has become clear over the life of the SPIRAL project. 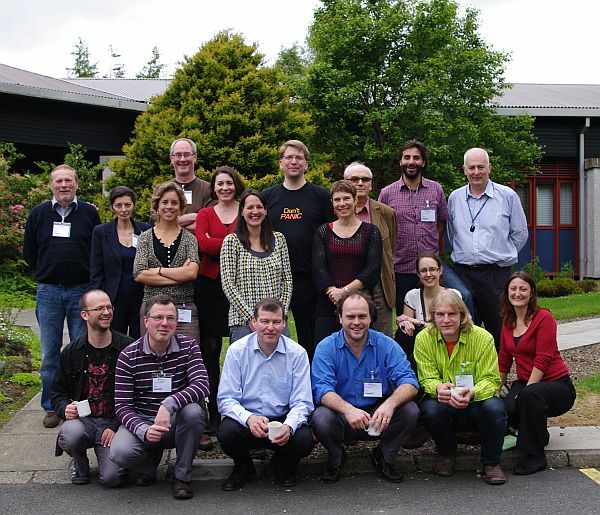 We hope that the resources made available by SPIRAL will help this process but believe that in order to achieve effective action in conserving biodiversity, sustainably using our natural resources and developing nature-based solutions for society’s challenges, a step-change – from interface to alliance – between science, policy and society is needed. Liaising with other knowledge brokerage projects to identify common areas across sectors regarding best practice science-policy interfacing. This could be achieved through workshops with coordinators of knowledge brokerage projects. Engaging with and learning from business partners. This could help business achieve the necessary transformation towards business models that can deliver a green and circular economy, and provide valuable insights on indirect science-policy-society interfaces. Distance training through the development of online training course(s). These courses could potentially be supplemented with online ‘mentors’ who could carry out training and/or help with troubleshooting. Training the trainer. This bottom-up initiative would lead to the development of a network of AfriBES trainers across Africa, who could coordinate smaller networks of AfriBES users. Summer Schools for individuals interested in participating in, or improving their knowledge of, science-policy interfaces. The Summer schools could incorporate seminars by individuals from science, policy, civil society and private sector working at the science-policy-society interface, and working groups where students could develop their knowledge of, and plans for, science-policy interfacing. Regular SPI organised by DG RTD, such as the workshop mentioned above. SPIRAL Workshops organised as part of project meetings, conferences and/or events. SPIRAL ‘mentors’ could present the SPIRAL handbook, and engage with teams on how to apply the handbook to improve their science-policy activities. This could result in the development of SPI roadmaps, i.e. the practical steps needed to achieve their SPI goal(s). We hope the work of SPIRAL has been and continues to be of use. Certainly we have learned a great deal over the last 3 years and have enjoyed working with you all.